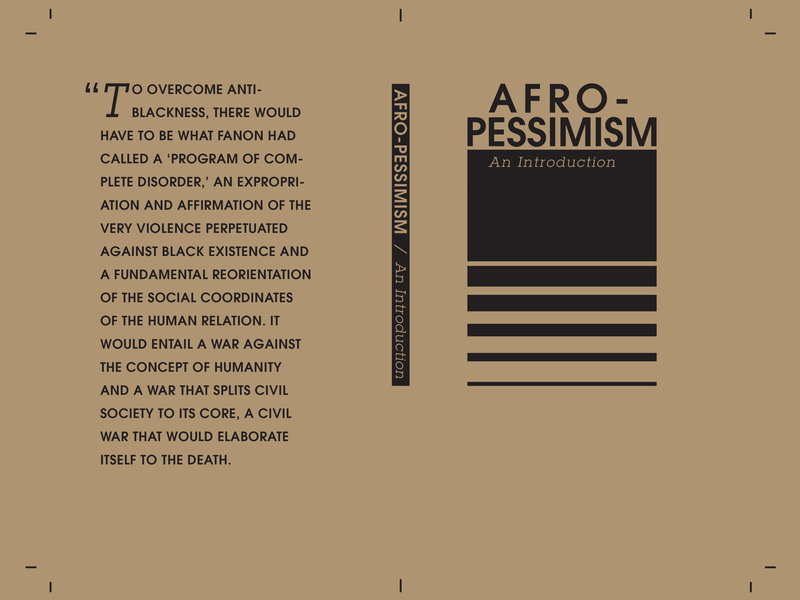 The PDF now contains a new preface readdressing some intentions of the project and on engaging with Afro-pessimism when non-Black. 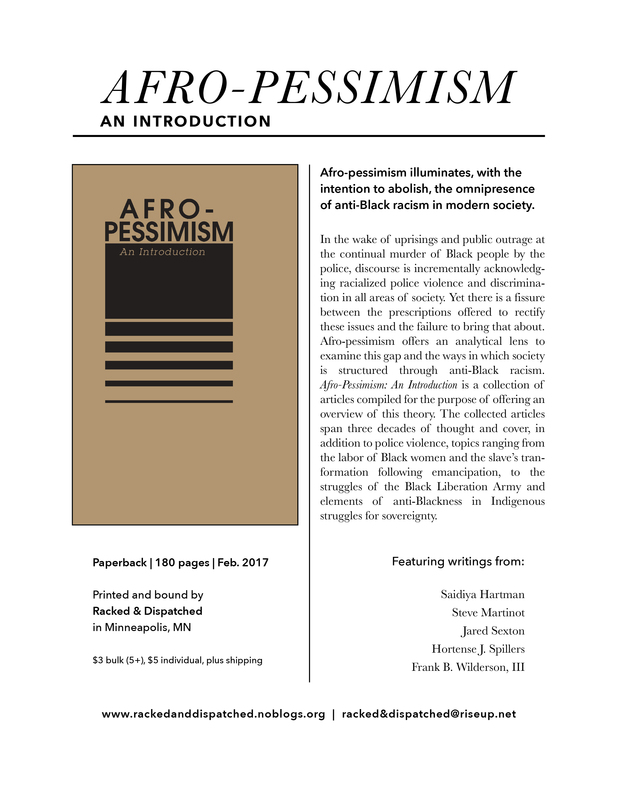 All 200 copies of Afro-Pessimism: An Introduction are out of stock as of today and we will not be taking any further orders. All orders will be shipped as of 5/31/17. If you’ve placed an order and haven’t received your copy yet, please get in touch so we can look into it. Thank you to everyone who placed orders and offered to carry this title in their bookstore or distro. Big thanks too, to those who donated extra to support us sending copies no charge to Books to Prisoners programs. We still have a few copies remaining for those inside. Contact us if you know of a BTP program that will use them. You can still download the book to print or view on digital devices here. Stay tuned for another title later in 2017. 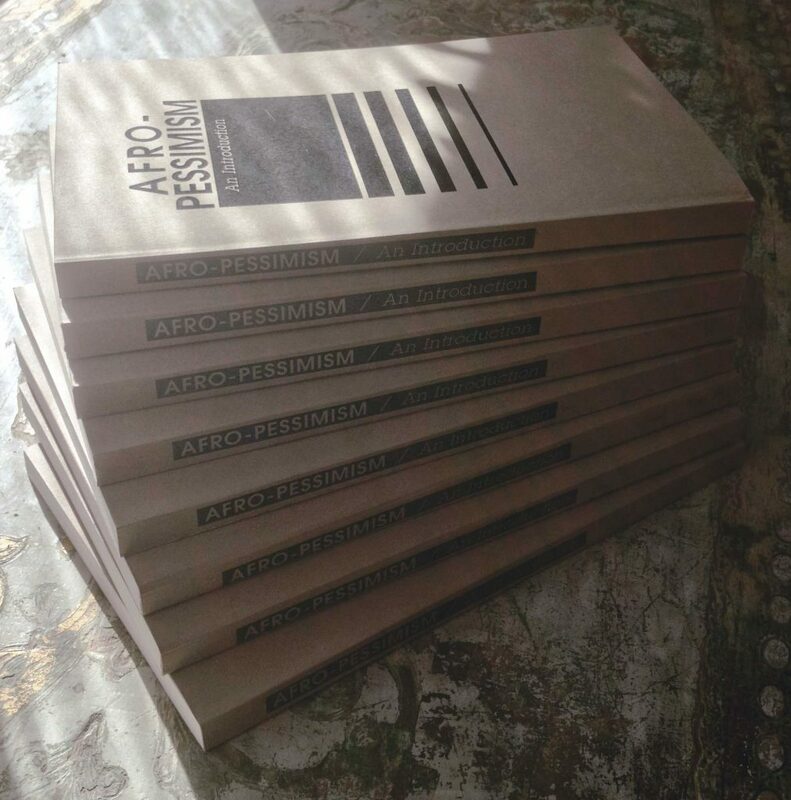 Orders continue rolling in and we’re down to the last few copies of this edition of Afro-Pessimism: An Introduction. If you were thinking about getting a copy, email ASAP. We’ll post again when we’re totally out of stock. As always, you can download and print the PDF. The cost is just enough to recoup expenses put into this project and maintain the ability to put out more books. We will be sending free copies to books to prisoners programs and welcome anyone who wants to send an extra $5 or more to subsidize that. Interested BTP programs please email to place a request. Though there is no affiliation with the authors, R&D wishes to thank them for their years of effort in defending these ideas and composing these works. Racked & Dispatched is a publishing ensemble. We push books that elaborate antagonisms toward the forces destroying our lives.